"I am really impressed with the Guitar Artistry DVD. It’s a great collection of songs and the performances couldn't be better. 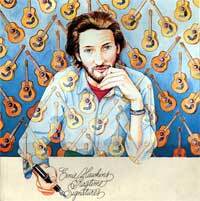 There is a nice balance between the music, stories and biographical info, and Ernie’s thoughts about playing guitar. The camera work is also excellent, and even though this isn't an instructional DVD, there are lots of great licks to be learned from these performances. I can't get enough of Ernie’s music!" 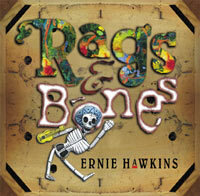 Guitar Artistry of Ernie Hawkins - Blues and Ragtime Guitar. This ninety minute long disc is one in a series from the Stefan Grossman Guitar Workshop Inc stable and others in this highly recommended series, include Rory Block and Paul Geremia. In this relaxed session acoustic guitar picker and vocalist Hawkins talks informally about his life and times, as well as performing an intriguing selection of songs and instrumentals. Sixty year old Hawkins has led a fascinating life, leaving school as a teenager and travelling around the USA searching out musicians and material, as well as gaining a university degree. He met and performed with many legendary players including Son House, Fred McDowell, Jim Brewer and Manse Lipscomb, but it was the legendary Rev. Gary Davis that had one of the most powerful influences. Hawkins is a highly skilled interpreter of Davis’s music and there are a number of his titles here including ‘Will There Be Stars In My Crown’, ‘Penitentiary Blues’ and ‘Florida Blues’, three instrumentals that Hawkins learnt direct from Davis which I do not believe Davis ever recorded. (Hawkins has a number of excellent teaching DVD’s out on the Vestapol label including two teaching the music of Davis, as well as of two well received solo discs – all worth searching out). There is no doubt that Davis had a tremendous influence on Hawkins but he talks equally enthusiastically and knowledgeably of other musicians including Skip James, Blind Blake, Mississippi John Hurt and Lightnin’ Hopkins, and performs titles from each of them. I particularly enjoyed his interpretation of Louis Armstrong’s ‘Potato Head Blues’ and he talks with passion about his interest in African guitar music and includes and beautifully lilting instrumental ‘ Masanga’. The session is filmed in a simple and tasteful setting with first rate camera work, which guitar players will find very useful, and Hawkins comes over as a highly committed, skilled and experienced musician. This disc I am sure will have a wide appeal and I hope that before very long Hawkins will have a major tour of the UK and I for one would look forward to that with anticipation. 1. Make Believe Stunt: 2:51 (Rev. Gary Davis arr. E. Hawkins, Chandos Music ASCAP. "I'd rather spin Hawkins' new disc than anything 'new' by The Rolling Stones. It's clear to anyone with ears which cat can play the blues." Western Pennsylvania's master of acoustic blues guitar returns with another spectacular offering of Blues, Gospel and Dance Tunes, with just a little Voodoo thrown in to boot. 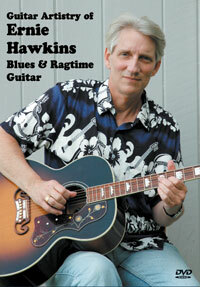 Hawkins has been building his reputation as one of the (perhaps the) finest purveyors of solo acoustic blues guitar playing in the world. 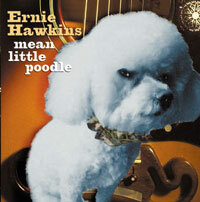 Ernie's most recent CD, Mean Little Poodle, opens with an imaginative take on one of the most famous guitar instrumentals, Freddie King's "Hideaway." Ernie plays the classic in the style of Lightnin' Hopkins. Ernie's playing is very fluid and he creates a dead-on impression of Lightnin' playing Freddie's song. Hawkins plays tribute to several of the great old bluesmen: an excellent version of Blind Blake's "Chump Man;" a rendition of Blind Boy Fuller's "Weeping Willow" on which he incorporates several signature guitar licks from Rev. Gary Davis; and Blind Willie Johnson's "The Soul of a Man". The original 1930 version featured a frighteningly harsh vocal by Johnson. Hawkins gives the song a lighter, more sensitive treatment; his best vocal performance to date, subtle, moving and powerful. Ernie has made some wonderful choices for vocal performances pieces. He approaches Blind Willie McTell's "Delia" just a little slower than other versions I've heard, and in so doing brings out the sadness inherent in this song (with it's refrain: "
All the friends I've had are gone".). Ernie sounds perfectly comfortable with his lively version of Fuller's "Step It Up and Go" with his guitar dancing all through the piece. He gets adventurous with an original piece, "Voodoo Soup", that he describes as "magic and love simmering on a hot Texas night." The description is accurate, although it sounds more of New Orleans than Texas to my ears. This piece grew on me after a few listenings with its wild, haunting slide guitar and ominous deep re-verb on the vocals. As please as I am with Ernie's improved vocal performances, the highlights on this CD are the four instrumental tracks. In addition to "Lightnin's Hideaway," Ernie adapts a Bix Biederbecke piece, "I Need Some Pettin'" for solo guitar and plays it with supple delicacy. His take on a traditional tune, known as "Railroad Blues" is absolutely flawless, evoking wistfulness and danger at the same time. 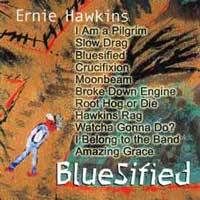 Of course, no Ernie Hawkins CD is complete without a flat-out great tribute to Rev. Gary Davis. No one can touch Ernie when it comes to playing Rev. Gary, and this version of "Fox Trot/Buck Dance" is a killer. 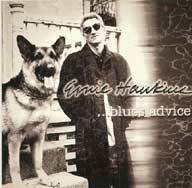 "Ernie Hawkins is a true living apostle of the True Living Blues. He not only plays each note authentically and flawlessly in a wide variety of traditional and modern blues styles, but more importantly, he delivers a huge measure of soul in every note - and after all - that's what the Blues are all about!" "Ragtime Signatures" is currently out of print and these are CD-Rs to order with typed track listing - no cover art. We are hoping to re-issue this on CD soon. Also, we have available limited quantities of the original Collector Vinyl LP for $50. The rich acoustic textures and pleasant musicality of these arrangements quickly warmed me up to the virtues of this record. 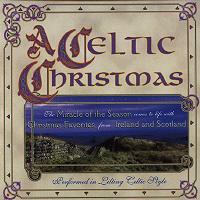 Featuring a tremendously talented group of contemporary folk musicians, A Celtic Christmas resonates with the sounds of the British Isles. George Balderose's fine work on bagpipes lays down the Scottish base for a catchy instrumental quartet. L.E. McCullough contributes a hint of Irish spring with his tin whistle. T.H. Gillespie adds beautifully traditional percussive sensibilities, and Ernie Hawkins knits these brilliant threads into a beautiful Celtic fabric with his strong, but relatively understated work on guitar. I particularly liked the sound of The First Noel/Joy to the World medley and thought their arrangement of Auld Lang Syne, which featured the instrument and mood of each musician in turn, was appropriately sentimental for ringing in a new millennium. An evocative and pleasurable experience. 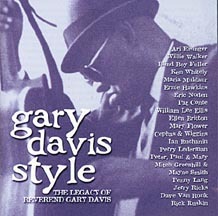 Various artists GARY DAVIS STYLE: THE LEGACY OF REV. GARY DAVIS 2002 -- Recordings by contemporaries Willie Walker and Blind Boy Fuller, and modern recordings by many of his disciples and proteges including Dave van Ronk, Ian Buchanan, Mary Flower, Rick Ruskin, Cephas & Wiggins, "Philadelphia" Jerry Ricks, Maria Muldaur, Ernie Hawkins, Peter Paul & Mary and more. Produced by Andy Cohen. There be Stars in my Crown"and "I am the Light of This World" with Maria Muldaur.